CONSTRUCTION WORKERS IN Britain, including around 5 Irish electricians and engineers are to sue Sir Robert McAlpine Ltd over allegations the company used a blacklist to refuse them work. London based solicitors Guney, Clark and Ryan who are representing 86 workers in total said legal papers were served about a fortnight ago. 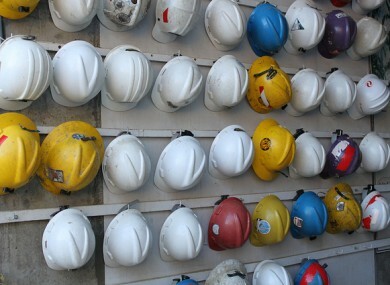 An investigation in 2009 found that The Consulting Association held details of 3,213 construction workers including trade union activity, employment history and personal lives. Sir Robert McAlpine was one of the 45 firms found in the investigation to have used information gathered by the Consulting Association. Liam Dunne, one of the solicitors for the workers said this treatment had a ‘devastating effect’ on their lives with many suffering from depression. Dunne said one of the primary motivations for the workers is to bring the issue to the wider public’s attention and “ensure a blacklist doesn’t operate again”. Electrician Kieran McGurran, one of the workers involved in the legal action told TheJournal.ie about the “detrimental personal impact” being on a blacklist has had on his life. McGurran said he left Donegal for England in the 1980s like many tradesmen at the time and said he had “many happy years and good times working away”. It was after the tribunal that I was added to the blacklist and at the time I hadn’t a clue. I couldn’t believe it at first, I’d heard rumours over the years about a blacklist but I never paid much heed to it. I always thought that people on a blacklist would have done something terrible but all we did was try to defend ourselves at a tribunal. McGurran said over the last ten years he has been working on and off, some years earning just £15,000. McGurran had plans to get a house back in Donegal but said his financial situation over the last ten years has prevented him from doing so. He said he wants to bring recognition to his plight over the last ten years to ensure workers today feel like they can speak up. “I couldn’t believe it could happen to me but it could happen to anyone and ten years on it’s still affecting me today,” he said. A spokesperson for Sir Robert McApline said it would be “inappropriate for the company to comment” because of legal proceedings. Email “Blacklisted Irish construction workers to sue UK company”. Feedback on “Blacklisted Irish construction workers to sue UK company”.